Designers Nina Jobs and Pierre Sindre will together design the Gärsnäs stand at the Stockholm Furniture & Light Fair. Both are very familiar with the company and have designed a number of classics for Gärsnäs over the years. Their focus will be on highlighting the authenticity, craftsmanship and sustainability of Gärsnäs. A fundamental concept is that all material used for the airy and welcoming Gärsnäs stand is reused or recycled. Nina Jobs and Pierre Sindre will be making the best use of resources and ensuring nothing goes to waste. Careful thinking about sustainability at all stages is the leading principle of the year’s new furniture designs. Pierre Sindre: As a designer, you can feel lonely sometimes in your studio; so it’s great to get the opportunity to collaborate. One advantage of working together is that you push each other a bit and have to step out of your own comfort zone. That’s always beneficial. Nina Jobs: We haven’t worked together before, but it immediately felt like we were a good combination. We had the same vision about Gärsnäs, so the work progressed without any friction! What have you chosen to highlight in your design of the Gärsnäs stand? NJ: The authenticity and craftsmanship. Above all, it’s about the honest and true materials, like letting the furniture show a timeless form and the good workmanship. PS: Also we chose to take that discussion to a new level. Because the stand isn’t actually constructed and all materials can be reused, we have made a significant step forward. In an age when many talk about sustainability, how do you get your message heard? NJ: For Gärsnäs that’s not a problem. It’s so apparent that sustainability is key. Just look at their materials and finishes. There are absolutely no shortcuts anywhere, which is a great foundation. PS: We always discuss every choice we face, such as materials and also transport issues. Matters concerning a circular economy are included from the start of each project. 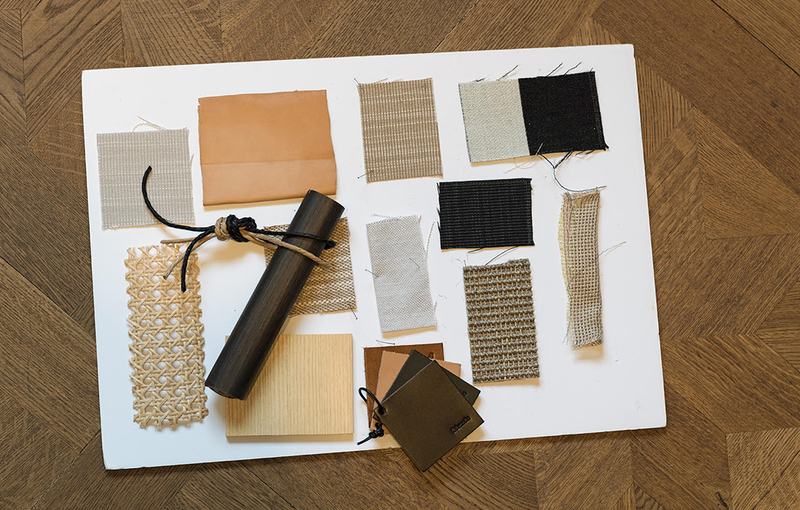 Do you decide the colour and fabrics of the furniture shown at the fair? PS: Yes, it is part of the stand’s overall expression. On the other hand, it’s important to check first with the other designers. When it comes to fabrics, Nina and I have the same opinion that it must work with the furniture’s style without completely dominating. What does the Stockholm Furniture & Light Fair mean to you? PS: The fair is incredibly important to everyone in the industry. It’s like the start of the school year. The term begins with the Stockholm Furniture Fair and then for the rest of the year you reap what you sow. As a designer, how do you manage to produce new designs every year? NJ: One of the advantages of working with Gärsnäs is knowing they would never push out new designs just for the sake of it. That’s why it doesn’t feel like a strain. When you work closely with a company for many years, new needs arise naturally.